Green Zebra Dune Buggies Tour Puerto Vallarta - Discounts! 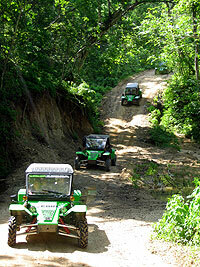 Finally a safe, fun, and exciting off-road dune buggy tour in Puerto Vallarta! All-new to Puerto Vallarta are these 2-seat or 4-seat Tomcars by Green Zebra, available at a discount right here every day. This tour will take you into the Sierra Madre mountain range, where you'll enjoy stunning vistas of Puerto Vallarta, as well as off-road excitement. After a short drive out of downtown, the real adventure will commence as you wind your way up into the Sierra Madre, making exciting climbs and daring descents, passing over small seasonal creeks and rivers, through the subtropical rain forest and culminating at panoramic viewpoints of Puerto Vallarta and Banderas Bay beyond. We'll make a stop at Rancho Las Vegas, an authentic Mexican rancho, where you can enjoy a nice lunch, relax in hammocks, or explore the river. After this enjoyable break, the excursion heads back off-road with more challenging jungle treks and seasonal river crossings, until reaching the end of our journey. If you're looking for a different way to experience rural Puerto Vallarta, check out the Green Zebra, a safe, comfortable, fun dune buggy tour that gets you well off the beaten track! Kids: Drivers must be 18 years old and have a valid drivers license. Shared riders are ages 4 and up. Kids are the same price as adults. Notes: We have both 2-seat and 4-seat buggies available. Please specify which you would like in the special instructions when booking. First person must be the driver (if you want your guide to drive you, please put your request in the special instructions when booking). Due to it's departure location, this tour involves some city driving. Depending on weather conditions, the tour route may change or have minor variations. Some rivers and streams may not be running during the dry season. PLEASE BOOK THE 2:00PM START TIME. 9:00AM WILL BE VERY DIFFICULT FOR YOU TO MAKE THE TOUR ON TIME. SHIP TIME IS USUALLY 1 HOUR EARLIER THAN PV LOCAL TIME.